Escuela Normal Superior de Piedecuesta (Santander Department) was established in 1953. Originally open only to boys (Escuela Normal Superior de Varones), the school was renamed in 1964 Escuela Normal Nacional Mixta, and, eventually, Escuela Normal Superior de Piedecuesta by Resolution No. 17,340 of 27 November 2000. The flag of the institute is horizontally divided green-yellow. "Colegio Gimnasio Piedemonte" is located in Bucaramanga. The flag of the institute, as shown graphically and described on the website of the institute, is white with two thin diagonal stripes in the lower left and upper right corners, blue and red, respectively, and the emblem of the institute in the middle. White symbolizes truth, justice and respect, as well as a open mind to new and improved ideals and knowledge. Blue symbolizes nature, source of life, and the commitment to protect it through an intimate connivance with it and our neighbour. Red recalls us love, energy and passion required to study, teach, live and fulfill our mission in the service of the society and of our country. The emblem of the institute is circular and divided into four equal parts. The upper left part is charged with a representation of the earth, meaning that we should be prepared to be citizens both of Colombia and of the world. The upper right part is charged with the lamp of knowledge. The lower left part is charged with a landscape, requiring the protection and preservation of natural environment. The lower right parts is charged with the five Olympic rings representing permanent contact with sport. 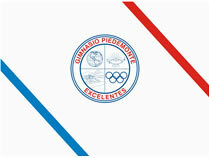 The border of the emblem is charged with the white lettering "GIMNASIO PIEDEMONTE / EXCELENTES". Gimnasio Pedagógico Pierre Faure was established on 10 October 2003 in Bucaramanga (Santander Department) by Fanny Inés Luna Pico The institute is named for the French Jesuit priest Pierre Faure (1904-1988), the promoter of "community and personalized education". The flag of the institute is horizontally divided blue-red with a white star in the middle. Along the hoist is placed a vertical white stripe charged with the institute's emblem. Red is a symbol of leadership and love. Blue is a symbol of intelligence and responsibility. White is a symbol of purity and innocence. The star represents the human being at the center of the educational project of the institute. Corporación Universidad Piloto de Colombia - my university (Bogotá, Distrito Capital and Girardot, Cundinamarca). I didn't have found any sources that confirms the flag and the image is only a product of visual research in my university. "Instituto Técnico Industrial Piloto" (ITIPI) was founded in 1939 in Bogotá as "Escuela Complementaria de Espacializacion Artistica". Renamed "Instituto Popular de Cultura" in 1949, the institute was given its current name in 1954. The flag of ITIPI, as shown graphically on the website of the institute, is horizontally divided white-green with the emblem of ITIPI in the middle. The emblem of ITIPI is a white disk surrounded by a green ring charged with "I.E.D. INSTITUTO TECNICO INDUSTRIAL PILOTO / BOGOTA" in white letters and charged with a green device presumably recalling the acronym of the institute and (my own interpretation) a caliper rule. "Escuela Normal Superior de Pitalito" was founded on 30 April 1950 in Pitalito, Department of Huila, succeeding "Colegio San Antonio", founded in 1927. A competition for the flag of the institute was organized in 1975, the year of the silver jubilee of the institute. The winner was student Fernando Antonio Rincón Trujillo, who proposed a flag with three equal, green-white-red stripes. Green represents the valley of Laboyos. White represents the traditional hospitality, generosity and good customs of the inhabitants of the region. Red symbolizes the vitality and strength of the youth studying at the institute. The arrangement of the stripes is, unfortunately, not given. Instituto de Niños Especiales was established in 1978 in Sincelejo (Sucre Department) for the education of children with Down's syndrome. Instituto Nacional de Niños Especiales (INNES) was founded in 1983 by Myriam Mercado Pacheco and Militza Anaya Gómez, on a plot located in the Las Brisas borough, offered by the local chapter of the Lion's Club. Centro de Educación Integral para Poblaciones Especiales (CEIPE) was established by Resolution No. 226 of 15 February 2000. Institución Educativa para Poblaciones Especiales was eventually established by Decree No. 8 of 8 January 2003. The flag is green with the institute's emblem in the middle. The emblem of the institutes features two children symbolizing the equality of all human beings, a book representing science and knowledge, two hands representing acceptance, solidarity, cooperation, and work to develop skills, and a torch symbolizing triumph and sports achievement. "Colegio Policarpa Salavarrieta" was founded on 11 May 1948 in Bogotá by Decree No. 1,521 of the Ministry of National Education, as "Instituto Policarpa Salavarrieta", a girls' college depending on "Colegio Mayor de Cundinamarca". In 1963, the college became autonomous and was renamed "Liceo Nacional Feminino Policarpa Salavarrieta". Open to boys in 1974, the college was renamed "Liceo Nacional Policarpa Salavarrieta", subsequently "Institución Educativa Distrital Colegio Policarpa Salavarrieta". The institute is named for the heroin Policarpa Salavarrieta (1795-1817), aka La Pola, shot by the Spaniards in Bogotá. The flag of the institute is shown graphically on the institute's website as green with the institute's emblem in the middle. Green represents hope in the future. The emblem of the institute is a shield with the national colors, charged with a hand holding a flaming torch, issuant from the base, meaning constant work, energy and viability. The shield is bordered by a green stripe symbolizing biodiversity and hope in a better future, charged with the name of the institute and its motto "RESPONSABILIDAD IDENTITAD Y TRANSCENDENCIA" (Responsibility Identity and Transcendence). Escuela de Policía "Simón Bolívar" (ESBOL) is located in Tuluá, Valle del Cauca. The flag of ESBOL is horizontally divided red-green-white, that is, the flag of the town of Tuluá, with the school's emblem superimposed. Red is a symbol of force, triumph, audacity and highness, which are the virtues used by the police to maintain peace and generate patriotic order and progress. Green is the institutional color, as a symbol of faith, friendship, hope, commitment and respect. White is a symbol of purity, loyalty, sincerity, clarity and peace, which are virtues characteristic of the police. The emblem of ESBOL is prescribed by Resolution No. 6,710, adopted on 14 August 1980. The emblem is of round shape (Spanish-Arabic). The upper quarter, azure, features a dove passant argent beaked and armed gules, the eye represented as a tortil azure and holding in the beak a bough of olive with eight leaves nervated sable. The lower left quarter, vert, features a book or inscribed with 11 lines sable. The lower right quarter, purpure, features an oil lamp argent with a flame or. The emblem is surrounded by a ring, in the upper part, or inscribed with the school's name on letters sable, in the lower part, argent inscribed with the motto "ESTUDIAMOS PARA SERVIR" (We Study To Serve) in letters gules. The circular shape is a symbol of God's infinite perfection. Argent, a noble metal in heraldry, is a symbol of integrity, sincerity, obedience, firmness, vigilance, eloquence and triumph, which are rare virtues to be taught to the students. Gules is a symbol of force, triumph, audacity and highness, which are the virtues used by the police to maintain peace and generate patriotic order and progress. Vert is the institutional color, as a symbol of faith, friendship, hope, commitment and respect. Or, a noble metal in heraldry, is a symbol of nobleness, magnanimity and wealth. All our spiritual and material resources shall be dedicated to the defense of the law. Purpure is a symbol of greatness and wisdom, highlighting the fact that the greatness of a people shall be matched by the importance of its police. The flag of the institute is presented in the institute's Etiquette Guidebook as horizontally divided blue-white-yellow with the institute's emblem in the middle. Escuela Normal Nacional de Popayán (Valle Department) was established in 1934 as Escuela Normal Nacional de Señoritas, and subsequently renamed Escuela Normal Superior de Popayán. The flag of the institute is horizontally divided white-green. The Fundacion Universitaria de Popayan was established in 1982 in Popayan. The grounds of the foundation were destroyed by the earthquake of 31 March 1983. New grounds were inaugurated on 1 August 1983. The Foundation manages a botanical garden dedicated to biodiversity preservation, ethnobotany and germplasm conservation. The garden is a member of the national networks of botanical gardens, prescribed by law #229 in 1996. The flag of the FUP is horizontally divided in three equal stripes, whose colours cannot be ascertained from the source quoted below. For the attached image, I have selected a grey-green upper stripe and a dark blue lower stripe, but these shades need to be confirmed (or corrected). Source: <www.fup.edu.co>, located by Dov Gutterman. Institución Educativa Popular Diocesano was established in Dosquebradas (Risaralda Department), by Resolution No. 2,517 of 21 November 2002 as the merger of Colegio Seminario Popular Diocesano (est. 6 March 1972 by His Grace Baltasar Álvarez Restrepo; Bishop of Pereira from 1952 to 1976), Escuela Jesus Maestro (est. 23 February 1973 by Sisters Elena Narvaéz and Mariana Salazar), Escuela Luis Carlos Galán Sarmiento (est. 1990), and Centro Docente Rubén Sanin Mejia (est. 1999 as Centro Docente La Esneda). The flag of the institute is described in the institute's Etiquette Guidebook as horizontally divided red-green with a blue triangle placed along the hoist. Red is a symbol of sacrifice. Green is symbol of hope. Blue is a symbol of perseverance and of the sky. The blue triangle represents the sky that always protects us.